This cover is just too freaking cute. First of all, the perspective is a really neat take on the usual girl-face cover. It creates this really nice focal point for the comic characters. 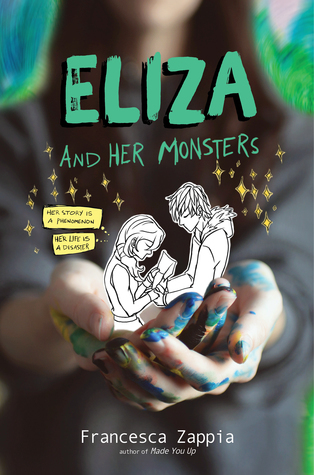 It's a nice image, Eliza holding her art, and with the speech bubbles, doodled starts, and brush-stroke letters, it gives you a sense of the quirky whimsy the book promises. I only am a little hung up on the author name. The text just doesn't seem to fit. Not sure if it's the font or the size, but it's a little too stark against the blurred body. Maybe the title text needs to be bigger? I'm gonna shut up. Either way, it's a fun, colorful contemporary cover and I can't wait to read it.